Would you like to know how we engaged more than 3000 women in local activities in Bucks? If you’ve already read some of our posts, you know about our 2-step process and if not, this is going to be the perfect example of how it works. We all need a marketing system that generates leads, and that’s what our approach guarantees. 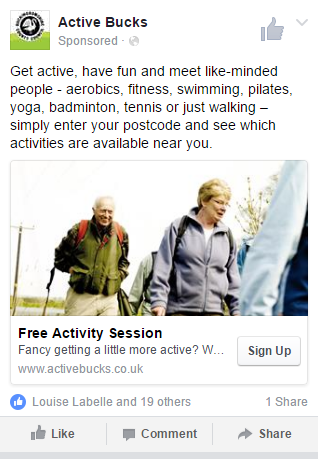 Bucks County Council asked Make Sport Fun to run a campaign to engage their adult population. This launched in May 2016. 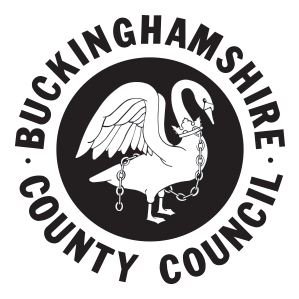 Active Bucks is a project run by the Bucks County Council public health team, aimed at increasing activity participation for all, but particularly amongst inactive people and those not meeting the CMO (Chief Medical Officer) guidelines. We started by building a database of activities – collecting details of thousands of activities taking place each week across the whole of Bucks, finally gathering more than 2000 activities. This process required emailing sports and leisure centres and private activity providers. 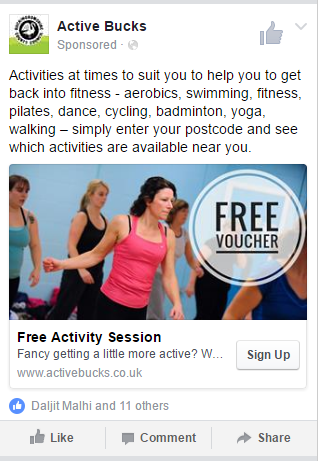 Everyone who agreed to be a part of the Active Bucks project would get free promotion of their activities in exchange for at least one free session. At the same time, we built an activity voucher site where people can find their ideal activity and download their free activity voucher. This page is simple to use and there are no distractions. How do we actually get people to turn up? This is where our 2 step process comes into play. We are driving traffic to the site through Facebook ads. The council communication team is also encouraging registration through existing email newsletters, PR and the council website. 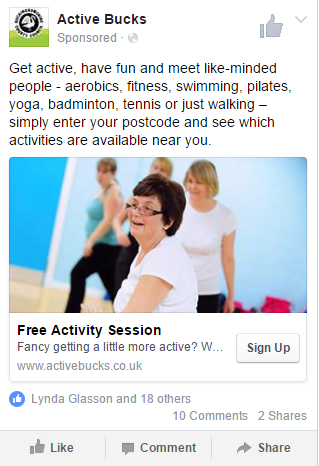 We used Facebook ads and advertised the offer of a free activity session to the target demographic: women aged 35 years and older living in Buckinghamshire. There’s one really important thing about targetting a vast area like Bucks. Be aware of where your activities are located. Most people are interested in activities no more than 3 to 5 miles away from their work or home. So if you have a cluster of activities in one area, focus on advertising up to a 5-mile radius. You don’t want to promote to people who don’t have any activities near to them – this will be a waste of money. That’s something we learnt from this campaign and we have been implementing ever since with great success. After someone registers for a free voucher, an automated confirmation email with the voucher is instantly sent to them. The email contains all necessary info for someone to attend the free activity. The picture on the right is what people immediately received when they opted into one of the offers. 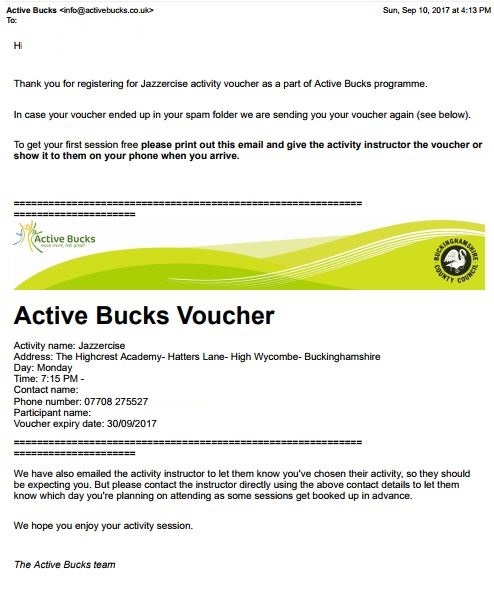 The 2nd thing that happens is that anyone who registers for a voucher gets’s placed into a 12-month long automated email series where they get motivational tips, case studies, ideas for staying active and more information on the Active Bucks programme. We also ask them a series of questions at 3, 6 and 12 months to track increases in their activity levels. Everything is tracked through a Customer Relationship Management (CRM) system. This entire process is automated, so no-one needs to spend time manually sending emails. The person gets their voucher immediately via email, no matter the time of day, so they don’t have to wait for someone to send it. Nothing falls through the cracks. When you use tools like Zapier, Mailchimp, Campaign Monitor etc., you’re able to make sure everyone who opts in is responded to. It saves time. The more systems that you automate, the more you allow yourself to focus on other areas of your work. 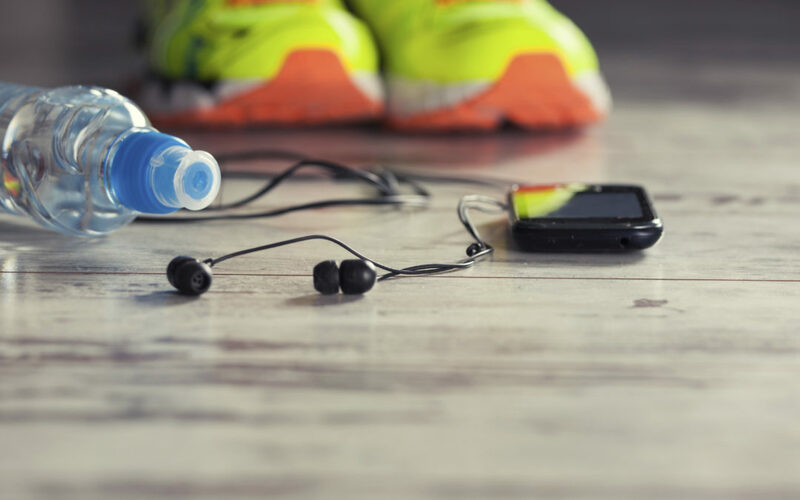 If at any point participants drop out of an activity, they are still getting our motivational emails encouraging them to stay active, and offering them other activities to try. Results from running mobile ads were far better than desktop ads showing us once again the shift from desktop to mobile internet use. I’m so pleased that I got involved with the Active Bucks programme because I received a voucher to try out Pilates at a venue near me and it’s been so good for me. I was surprised at how demanding it is, and I have discovered muscles I didn’t know I had. I have made very good progress – the teacher is brilliant – and one year later I am still doing it. I’m much fitter, more flexible and stronger. I walk to and from the venue, so that’s a fitness bonus too. In between the sessions I practise Pilates at home and I’m walking regularly. It’s all been very positive.